As a website editor, creating pages is part of your daily business. To create a page, activate the Edit mode via the Scrivito panel, and then select Create page from the top menu as shown below. Alternatively, with navigations, click their blue handle and select Add page from the menu. 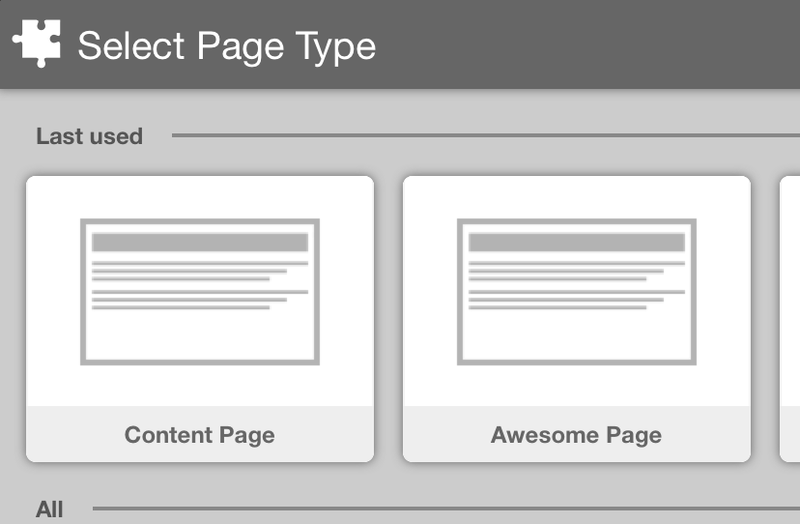 When creating a page, you are first asked to select its type from the list of available page types. A page added via the navigation menu is inserted into the navigation, whereas a page created via the top menu usually is a standalone page (see below). Create page This first opens the page type browser for choosing the type of the page you would like to create. Then the page is created and displayed and is ready for being edited. Note that the new page is not hierarchically connected to other pages since it doesn't have a path. Thus, the page won't show up in navigations based on the page hierarchy. However, you can add the page to navigations based on link lists or reference lists provided by the website developer for this purpose. 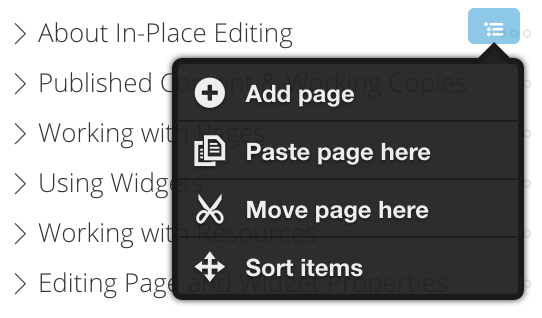 Add subpage Like with “Create page”, this first lets you choose the type of the page to add. The new page is then inserted as a child page underneath the current page. This menu command is only available if the current page is part of the page hierarchy, meaning that it needs to have a path. Duplicate page A page can be duplicated if it doesn't have a path or – if it does have a path – no other CMS objects are located underneath it. When duplicating a page, a copy of it, including all its content, is created. Embedded objects, however, e.g. images, are not duplicated but remain embedded on the new page. If the source page has a path, the duplicated page is inserted on the same hierarchy level. A duplicated page initially never has a permalink, even if the source page does. After a page has been duplicated, Scrivito displays the duplicate, so you you can start editing it right away. View / Edit page properties Opens the properties dialog for viewing or editing the properties of the page, depending on the selected mode. The properties a page has were given to it by a website developer. Every page type may have different properties, depending on its purpose. For example, a blogpost commonly has an “author” property which usually isn't required for standard pages. Share this page This displays the full URL of the page you are currently viewing for copying it to the clipboard and sharing it with someone. Next to the page ID, the URL includes the ID of the current working copy displayed in preview mode. The recipient needs to have access to the website and must have been made an owner of the working copy if access restrictions apply to working copies. 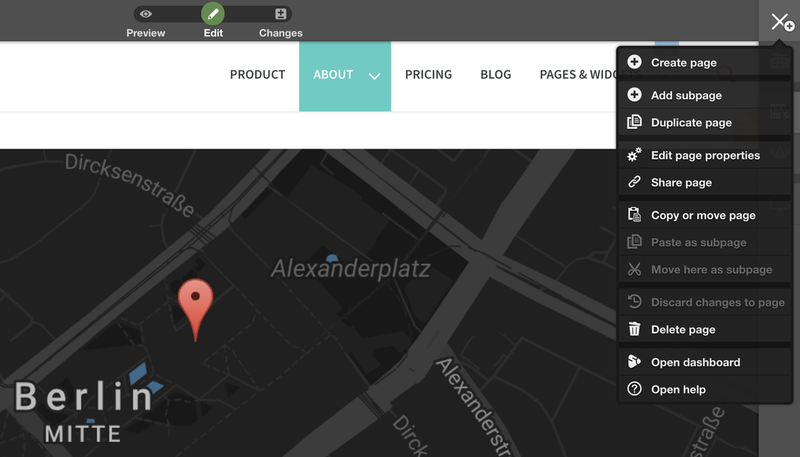 Copy or move page After selecting this item from the menu of a page, you can paste a copy of this page or move it to any location in the page hierarchy, using the menu of the destination page. The page to copy or move can also be inserted into an automatically generated navigation. Paste as subpage A page for which the “Copy or move page” command has been issued can be pasted as a subpage of the current page. This places a duplicate of the copied page as a child page underneath the current page. This menu command is only available if the current page is part of the page hierarchy, meaning that it needs to have a path. Also, no restrictions for inserting the page (based on its type) must apply. Move here as subpage After issuing the “Copy or move page” command, the page can be moved underneath the current page, meaning that the page becomes a child page of the current page. A page that has been edited in a working copy might have been edited in a different working copy as well. After publishing one of these working copies, overlapping edits in the other working copy may prevent it from being published in order to preserve the changes that were published first. After making sure that no relevant content will be lost, use this menu item to specify that the page in the affected working copy is to be the final version after publishing. Discard changes to page This puts the page back into the state it had when the current working copy was created. Please be cautious with this function because everything you altered on the page will be lost. However, this sometimes is an appropriate way to deal with changes that were made in a different working copy that has been published in the meantime. If such a conflict occurs, discard the changes to the page, then reapply the changes. Delete page When a page is deleted, all the content it contains is deleted as well, except for the binary resources such as images or other files. Such resources are not part of the CMS object that represents the page, and will thus not be deleted. A deleted page can be restored unless it was created in the currently selected working copy. Open dashboard This opens your Scrivito dashboard. Open help Opens the Editor's Guide of which this page is a part.